When you’ve lost a single tooth, you may be considering foregoing tooth replacement, thinking that no one will ever see it. Even if you can’t see the lost tooth in your smile, unseen damage is taking place. The surrounding teeth will shift to fill the gaps in your smile, and those teeth surrounding he gaps will need to absorb the extra pressure to make up for the missing tooth. Without stimulus from the tooth root, gum tissue volume and jawbone density are diminished overtime, putting you at risk for further tooth loss. For all of these reasons and more, the DeMartino Dental Group is here to help you replace any number of missing teeth. We offer tooth replacement solutions for one tooth or a full row of teeth. 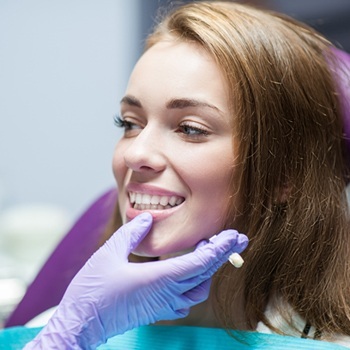 When you’re ready to explore your tooth replacement options, call our dental office in Phillipsburg to schedule a treatment consultation today. To replace a single tooth, we offer two options – traditional and implant supported fixed bridges. Traditional fixed bridges are prosthetics crafted with a row of replacement teeth with a dental crown fused on both sides. The dental crowns are attached to teeth on both sides of the lost tooth, recreating your healthy smile. Unfortunately, we need to remove a small amount of healthy tooth enamel from the supportive teeth to accommodate the additional structure of the dental crowns, and the root of the lost tooth is not replaced. 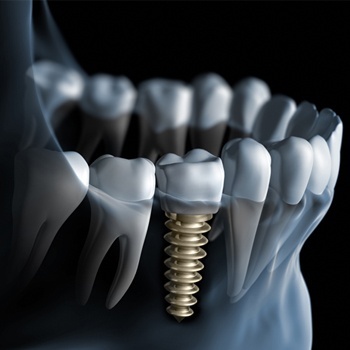 Dental implant supported crowns protect your surrounding teeth from damage, and they also replace the lost roots of your missing teeth, ensuring optimal oral health and function. What are Single Tooth Implants? Single tooth implants are a tooth replacement solution that combines one strategically positioned dental implant post with a custom crafted dental crown to replace both the tooth roots and the visible parts of teeth. This ensures a seamless restoration of your smile from the roots up. 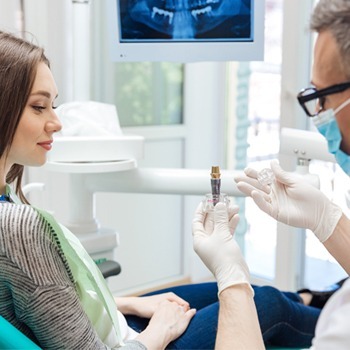 Great for oral health – other tooth replacement options place pressure on surrounding teeth and oral structures for support, which can cause unnecessary damage. Implant supported dentures are fully self-supporting, protecting your smile and maintaining oral health. Semi-permanent results – once in place, your implant supported dental crown will stay in place for three decades or longer. Fixed bridges need to be replaced every ten years to ensure optimal function. Easy care – once your implant supported dental crown is in place, you can continue your regular daily tooth brushing and flossing routine. No need for special cleaning techniques or tools. Confidence boosting – the replacement teeth blend seamlessly into your natural smile, giving you complete confidence.